Bladder stones are rock-like collections of minerals that form within the urinary bladder. They may occur as a large, single stone or as dozens of stones the size of large grains of sand or pea gravel. The two most common signs of bladder stones are bloody urine and straining to urinate. Blood appears because the stones mechanically irritate the bladder wall, causing bleeding from its surface. The blood may be seen as obvious clots or visible as only a light pink tinge depending on the severity of disease. Straining occurs when secondary to inflammation or when a stone temporarily or completely obstructs the passage of urine out of the bladder. Large stones may cause a partial obstruction at the point where the urine leaves the bladder and enters the urethra; small stones may flow with the urine into the urethra and cause an obstruction there. Urinary obstructions should be treated as emergencies!! 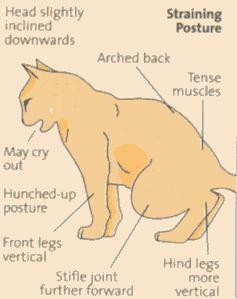 If your pet postures to urinate but is unable to pass any urine- call your veterinarian immediately. Urinary obstructions can lead to kidney damage and can be fatal. There are several different types of bladder stones and each form has a different underlying cause. In general, stones will form when one or more stone-forming compounds are present in elevated levels in the urine. This may be due to abnormalities in diet, metabolism, or due to previous bladder infection. Certain pet breeds may be genetically predisposed to bladder stone formation. When the amount of stone forming compounds reach a certain level, they precipitate to form tiny crystals. These crystals stick together and stones gradually form. As time passes, the stones enlarge and increase in number. Although it may take months for a large stone to grow, some sizable stones have been documented to form in as little as two weeks. These are examples of urinary crystals which may be precursors to bladder stones. There are several different types of crystals, but they do not necessarily correspond to the type of stone present. There are many different types of bladders stones (and some stones are composed of a combination of types). It is possible to have bladder stones without visible crystals in the urine and vice versa. Females are more prone to struvite stones while males are more apt to develop calcium based stones. Be aware that many disorders of the urinary tract can cause similar symptoms: bladder infection, kidney disease, diabetes, bladder cancer, etc. Bladder stones should be diagnosed by getting your veterinarian a fresh urine sample and performing an xray of the bladder. Your veterinarian will check the urine sample for signs of crystals, infection, urine concentration, and acidity level. Many bladder stones (because they are composed of dense mineral) will show up on a routine xray. Some, more rare forms of stones do not appear on xray and an ultrasound may be needed. This diagram demonstrates what straining to urinate looks like. Surgical removal - during surgery the abdomen and bladder are opened and the stones removed. Most pets do well with surgery and it offers fast relief from bladder pain and straining. The surgical option is usually necessary if a urinary obstruction has occurred or if a type of non - dissolvable stone is suspected. Once stones are removed, they can be analyzed for their exact composition- this helps determine how best to keep them from occurring again in the future. 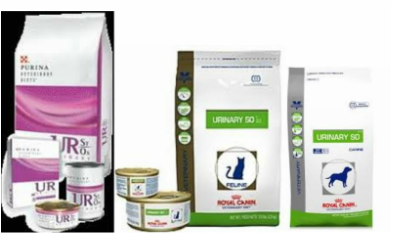 Dissolution Prescription Diet- these diets are available only under the guidance of a veterinarian - there is no over-the-counter equivalent. These diets have a special balance of minerals, protein, and ingredients to adjust the acidity level of the urine. These diets typically come as a dry kibble option or as a canned diet. It is VERY important to feed strictly the prescribed diet only as any other food / treat / tablescrap etc will negate the usefulness of the prescription diet. Prescription diets are beneficial because they are non invasive, but not all stones can be dissolved. Those that can make take weeks to months to fully dissolve depending on the original size of the stone. Additional therapies- your pet may also need antibiotics for secondary bladder infection or medications to help relieve pain. Other options- less commonly used options include Hydropropulsion (under anesthesia, the pet's bladder is infused with saline and then compressed rapidly in an effort to flush out small stones. There is a risk of obstruction with this technique and if unsuccessful, progresses to surgical removal) or Endoscopic removal (only performed at referral centers and may not be possible depending on the size of the stone and the pet). If your pet has already been diagnosed with urinary crystals, bladder stones, or frequent urinary tract infection, talk to your veterinarian about a prescription prevention diet. These prevention diets are extremely effective, but must be given as the sole source of food (mixing with other food, treats, tablescraps, etc will negate the effect of the diet). There are several over-the-counter "urinary health" diets, but there is a much higher risk of recurrence of disease compared to a prescription diet. Prescription diets will have a special balance of minerals (phosphorus, magnesium, and calcium) and protein as well as ingredients to help maintain a specific urine acidity. Once stones have developed- your pet will ALWAYS be at risk of their return. Keep your pet a healthy, lean weight. For example, dogs that are allowed outside more often to exercise also have more opportunities to drink water and urinate. Cats that are kept lean are more efficient at grooming and keeping their rear end cleaner helps prevent urinary tract disease as well as decrease the risk of diabetes. Encourage drinking. Your pet should always have access to clean, fresh water. You can also add a small amount of water to their diet, try adding ice cubes to the water bowl, or use a pet fountain. In pets that don't drink well, you may add a canned formulation of food (which contains more water than dry kibble). These are examples of urinary dissolution diets and prevention diets. There are several options available and many come in dry or canned formulations. Your veterinarian will help chose the right one for your pet- depending on the type of urinary tract disease present and any other underlying conditions.